October and the dark nights are with us again, making observing possible early in the evening and even earlier after the clocks go back on the 30th. In fact, I will set down an observing challenge. Right from the start of the month, it will be possible to see the brightest of all the planets, Venus. You will have to be looking out as soon as the Sun has set, which is around twenty to seven at the beginning of October. Find somewhere with a good view of the south-west horizon – you don’t need a compass, it’s just to the left of the glow of the sunset. Being so bright, Venus should be easy to spot, very low indeed, and on the third of the month a very thin crescent Moon will be close by, not only helping to locate the planet but creating an interesting spectacle to boot (what does that mean?). Day by day, Venus will become easier to find as the nights draw in and it travels further away from the Sun. Towards the end of the month, you will be able to start looking from about a quarter past six and on the 28th, Venus gets close to another planet, Saturn, although it will be nowhere near as bright. Anyway, try looking out for Venus every day and watch as it moves against the background sky. As the sky darkens, you can look out for Saturn in the same part of the sky until it sets around eight thirty. The Moon is close by on the 6th, so that should help with identification. Mars is still with us all month too, further to the left than Saturn and slightly higher, although its distinctive pink hue makes it easier to identify. The Moon muscles in on the eighth, getting bigger and brighter as it heads towards full on the 16th. This is a bit inconvenient as it means the Moon is still very bright indeed on the 21st, when we have a meteor shower known as the Orionids. This is a very interesting shower as it is the result of Earth passing through the debris trail left by perhaps the most famous comet, Halley’s, although we won‘t see that again for about another fifty years. Despite the lack of a dark sky, I think it is still worth looking out for meteors around this date because some can be very impressive. If you are one of those lucky(?) people who have to be up and about early in the morning (God bless our postmen), then you have the opportunity to complete the full set of bright planets. From around six thirty, Mercury and then Jupiter precede the Sun, rising in the East and day by day they get closer to each other, being in conjunction on the 11th. Mercury then starts to head back around the Sun and we lose it by about the 20th. So, get out there and become a planet spotter. 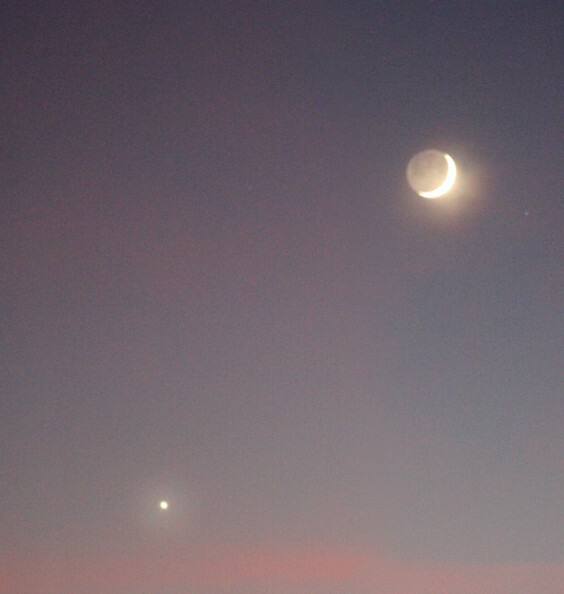 Above: The Moon and Venus.